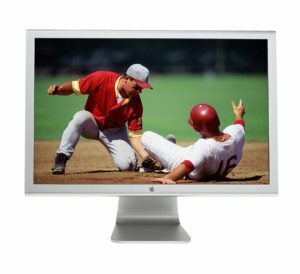 The Apple Cinema Display (23-inch, aluminum) is meant to complement the Apple hi-end products, such as the Power Macintosh G5 and PowerBook G4 models. It has an anodized aluminum casing with a slight bezel, and is mounted on an aluminum stand with an adjustable hinge. This display also meets the Electronics Standards Association’s (VESA) mounting interface standard, and can be mounted on a wall or an articulating arm. It is an active-matrix LCD matte display, and comes with a maximum resolution of 1920 x 1200 pixels, with an integrated two port USB hub, two FireWire “400” ports and the industry standard DVI (Digital Video Interface) socket. Thus, the Apple Cinema Display (23-Inch, Aluminum) is compatible not only with a Macintosh, but also with an IBM desktop. Supported resolutions (pixels): 1024 x 640, 1280 x 800. Brightness: 270 cd/m2, 400 cd/m2 (since August 7, 2006). Contrast ratio: 400:1, 700:1 (since August 7, 2006). Dimensions: 17.7 x 21.1 x 7.3. Displays interfaces: On the back of the display there are two USB ports and two FireWire ports. Power adapters: 90 W, model A1097 (23-inch display), input: 100-240 V AC, 50-60 Hz, output: 24.5 V ¯ 3.70 A maximum. Operating Environment: Operating temperature: from 10° to 35° C (50° to 95° F); Relative humidity: from 20% to 80% (noncondensing); Altitude: from 0 to 3048 meters (0 to 10,000 feet). Discontinued : On November 17, 2008. Some 23-inch Cinema Display features might require the latest version of Mac OS X. Users might also be able to use the 23-inch Apple Cinema Display with a Windows PC that has an appropriate video card with a DVI port. The Apple Cinema Display has an outboard power supply, which may warp, but otherwise, has a thorough design. Power supplies are available, so a user can replace the damaged ones, if needed. To use their 23-inch Apple Cinema Display, users needed Mac OS X v10.2.8 or later, and one of the following computers – the Power Mac G5, the Power Mac G4 with a DVI port, or the PowerBook with a DVI port. To update the software, the user should choose Apple (K) > System Preferences, click Software Update, and then click Check N.
If the owner had an iSight camera, he or she could mount the camera on top of the 23-inch Cinema display using one of the stands that came with the camera. The iSight stand has a tilt-and-swivel mechanism, so users could capture video at the best possible angle. All the user needed was to plug the FireWire cable from the camera into a FireWire port on the back of the display or computer (The iSight stand contains a magnet that might erase the data on a hard disk drive or iPod. To preserve the data, Apple suggests that the user keeps these and other magnetic media away from the iSight stand, and the top of their Cinema displays. Alternate Display Attachments: Apple suggested that it was possible to attach the 23-inch Cinema display to alternate mounting solutions using the VESA Mount Adapter kit, which is available from the Apple Store. It was quite easy to use the kit to prepare the display for attachment to many different VESA-compatible mounting solutions. All the user has to do was simply follow the instructions included with the kit. Apple advised against cleaning the screen with a cleaner containing alcohol or acetone. The company recommended instead, to use a cleaner intended for use with an LCD (liquid crystal display). Apple Inc. also warned never to spray cleaner directly on the screen, as it might drip inside the display and cause an electric shock. The power adapter for the display was a high-voltage component and should not be opened for any reason, even when it’s unplugged. Apple also recommended to use only the power adapter that came with your display and the AC cord that came with your power adapter. Adapters and cords for other electronic devices may look similar, but using them can affect your display’s performance, or even damage the display. The AC power cord has a three-wire grounding plug (a plug that has a third grounding pin) that will fit only a grounded AC outlet. Apple suggested that if a user was unable to insert the plug into an outlet because the outlet is not grounded, he or she should contact a licensed electrician to replace the outlet with a properly grounded outlet. Ergonomics: Apple Inc. recommended the following guidelines to assure the perfect relationship between the user and his or her 23-inch Cinema Display: Here are some guidelines for adjusting your display to reduce glare, as well as to accommodate your physical size and shape: Arrange the display so the top of the screen is slightly below eye level when you’re sitting at the keyboard. The best distance from your eyes to the screen is up to you, although most people seem to prefer 18 to 28 inches. Then, position the display by tilting it up or down, in order to minimize glare and reflections on the screen from overhead lights and nearby windows. See our text “Apple Cinema Display Error Codes” for details about Error codes for Cinema Display (23-Inch, Aluminum). Sell your old Apple Cinema Display to iGotOffer for the best price online: iGotOffer.com, fast and secure payment, free shipping: Sell my Apple Display for top cash. Apple Cinema Display (23-inch, DVI) presentation. Apple Cinema Display (23-inch, DVI) – User’s Guide by Apple (in PDF format). Video uploaded by David Di Franco on December 29, 2007.